"When the world heaves up, time to dance." 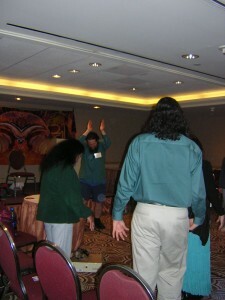 The "Hogue" leading Kundalini Meditation (conjuring orbs) at the Conscious Life Expo, LAX Hilton, Feb. 2009. Come meditate with me this coming 14 February, same "Bat" Bardo time, same "Bat" Bardo station. Many of you have written to me about the crescendo of earthquakes hitting the Caribbean region since the first temblor on 12 January stamped out 200,000 lives and counting in Haiti. Now an unnerving string of 5 and 6 point Richter Scale shocks — some of which are not near Haiti itself — visits this heretofore seismically serene and passive area almost daily. [Are you] keeping track that a 5.0 or 6.0 earthquake has hit almost everyday this week in different countries almost like tic tac toe and what do you think of this? It really feels like any day now there’s another Haiti coming. Prepare for one of the most significant string of natural disasters packed into one 12-month period in living memory. The world responds to the ending time cycles of many forecast prophetic ages. The year 2012 is only the American Idol darling of the popular media judges. Populist projections of Mayan Prophecy, often overlook in the flash and spaz of doomsday’s fad passing favorite, the mistranslated, misunderstood, sexed up façade of what is merely the 5,000-year Long Count cycle ending and restarting again in the Ancient Mayan Calendar on 21 December 2012. You don’t have to wait for 2012, ladies and gentlemen. All the blackberry votes for your favorite doomsday date will not give it more talent to fulfill your fears and axis shifting Tilt-alations. We have been in the travail of dying-rebirthing ages since 2008 and you can expect things to ramp up in revolutions from the heavens’ climate to the earth’s roll over and stir the salt waters of vast oceans and your momma’s placenta. Welcome to the first year of a new wild card decade in prophecy. Existence wants to shake us up on all levels of life with earthquakes in Haiti, political earthquakes in runoff elections in Massachusetts. Be prepared, Obama Nation, to Oboomah one day, Obomb-ah the next. GOPeak today and GOPlummit in mid-term. Watch the two-party duopoly in America come down like a Presidential Palace in Porte-au-Prince in this coming decade as they play a fraud on the voters pretending to shed the duopoly labels and play independent. We are entering new times when you will see the world change before your first cup of Joe at breakfast. Get used to it. Shake and roll with it. Learn to celebrate its challenges and change its inclinations to make a better destiny for your personal life, your community life, and your relationship with the world around you, by becoming a witnessing world within-you. Read further in Predictions for 2010 just how the new year is going to make the scene on the wild side. This entry was posted in Earthquakes and tagged 2012, blackberry, Brown, Coast to Coast, Democrats, earthquake, Election, GOP, Haiti earthquake, independent voters, Massachusetts, Mayan Calendar, Nostradamus, Obama, Porte-au-Prince, predictions for 2010. Bookmark the permalink. Post a comment or leave a trackback: Trackback URL.